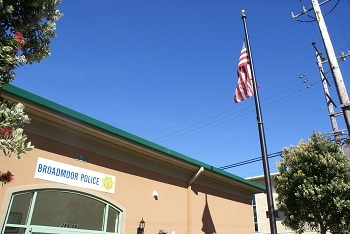 The governing body of the Broadmoor Police Protection District is a Police Commission of three residents elected at large by the voters of the district. Each commissioner is elected for a term of four years. The presiding officer of the Police Commission is the chairman and is selected annually by a vote of the sitting commissioners. The three commissioners serve without compensation. The primary responsibility of the Board of Police Commissioners is the formulation and evaluation of policy. 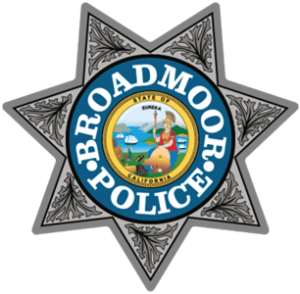 Routine matters concerning the operational aspects of the Broadmoor Police Department are the sole responsibility of the Chief of Police. The Police Commission selects and appoints only the Chief of Police. The Chief of Police is responsible for hiring all employees of the police department. The Police Commission also sets policy, determines and sets the annual budget, and hears appeals in certain personnel matters. The Commission meets the second Tuesday of every month. Members who live in the city of Broadmoor are welcome to attend. Note: Commission members are strictly volunteer positions within the community. Commissioner Sheridan has been on the police commission since 2001, when he was appointed to fill a vacancy. Joe began his law enforcement career in Broadmoor as a Police Explorer and rose to the rank of Corporal of Police. In 1999, he lateralled to the San Mateo County Sheriff’s Office. He has worked in a variety of positions there to included Patrol, Custody, School Resource/Community Policing Unit and the Office of Emergency Services. Joe has been a lifelong Broadmoor resident and resided with his wife Gina (Colma Fire Commissioner) and their four children. Click here to view Commissioner Sheridan’s Ethics Training Certificate. Commissioner Hutchens has proudly served the community as a Broadmoor Police Commissioner since 2007. Over the years Ralph has listened to the concerns of his neighbors and was on the Broadmoor Property Association Board for several years, and he has always fought for what he thought was the right thing to do for the residents of the Broadmoor Village. Ralph will continue to listen and serve the community and do the best job that he can as a Broadmoor Police Commissioner. Ralph was born in San Francisco and raised in Daly City, attending local schools and colleges. Ralph has been married to his Westmoor High School sweetheart for 46 years (former Miss Broadmoor 1970). Ralph and his wife have resided in Broadmoor Village for 46 years. They have 3 sons who are grown. Ralph retired in 2010 from his career as a Real Estate Agent, specializing in the Broadmoor Village area. Ralph volunteered to join the Navy and serve his country for which he loves, and is a Vietnam Veteran. Click here to view Commissioner Hutchens Ethics Training Certificate. Commissioner Michael Connolly is a career law enforcement officer and has thirty four years of law enforcement experience including service with the San Francisco Police Department, United States Department of Justice, Immigration and Naturalization Service and as the Assistant Director for the University of San Francisco, Department of Public Safety. Commissioner Connolly is currently a Deputy Chief of Police for the San Francisco Police Department. Deputy Chief Connolly oversees the Professional Standards and Principled Policing Bureau of the San Francisco Police Department. His prior assignments include Commanding Officer of the Investigations, Major Crimes Division, Forensic Services Division, and Chief of Staff for the Commander of Investigations. Additionally, Deputy Chief Connolly is a member of the Criminal Justice Leadership Advisory Board for the University of San Francisco, Law Enforcement Leadership Program; a graduate of the Federal Bureau of Investigations National Academy, and a member of the International Chiefs of Police Association. Click here to view Commissioner Connolly’s Ethics Training Certificate.